This small working dog is certainly a crowd pleaser. This small working dog is certainly a crowd pleaser. His high intelligence and complete loyalty allows him to excel in all areas of doggy life. A wonderfully friendly dog who is courageous as any little Scottish heart should. This wee little Scottish wonder has been known to be difficult to train, why you may ask? Because they are so intelligent! Meaning; if training is not consistent, fun, entertaining, enjoyable and all of the above your wee Cairn Terrier will just switch off. For this reason, he can be a challenge to train so if you are a first-time Cairn owner it’s best to get advice from those in the know. Your pup will need early socialisation. Puppy-preschool is a wealth of knowledge when it comes to early training, the significance of consistency and all the basics like toilet training and crate training. It’s also a good idea to book into an obedience school, so when your pup is 16weeks old they can begin to work on their training with distractions (AKA other dogs!). It’s essential to remember that this little dog will become your leader if he feels you are not leading him well enough, so training is paramount. If you do not have the time to train your dog or attend obedience school this might not be the right breed for you. Like with all breeds they do not respond well to harsh training methods and training must be entertaining for good results. With the correct training and understanding they can absolutely thrive (just think of Toto from the Wizard of OZ). 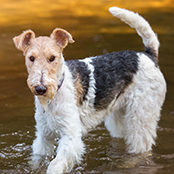 This double coated breed is actually quite easy to maintain and will only require a good brush once a week with minimal bathing – unless in true terrier fashion he’s found something pongy to roll in! If you over bathe him he will start to resemble a powder puff and lose his lovely wiry look. 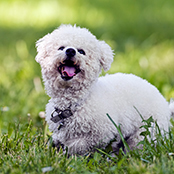 Like with all breeds it’s important to start nail-clipping at an early age, and as this breed can have a tendency to jump, this can prevent injury. Getting your puppy used to having their feet, face, ears touched is also a great way to vet-proof your grown dog for future check-ups. As a working terrier, this little guy loves to run, chase, explore, dig and bark. In saying this, if you do not correctly entertain and exercise your beloved friend, he will exhibit these behaviours on his own (cue chewed shoes). He will require a good brisk walk and a decent off-leash romp daily. As a terrier, he will also excel in dog sport. But training is important, your terrier loves to give chase and if this occurs off-leash and you do not have a solid recall command you may be putting your pup at risk of serious injury. The Cairn Terrier is a very intelligent breed of dog. Because of this, it is important that you flex his muscles and his brain daily. Any terrier like breed, when bored, will become destructive. Remembering that destructive behaviour such as digging, barking, escaping, and chewing is highly entertaining for a dog who is bored. A few clever boredom busting techniques such as rotating ‘home-alone’ toys, hiding treats around the yard, and treat/puzzle toys can make a huge difference. As too; adequate exercise before you leave for work. 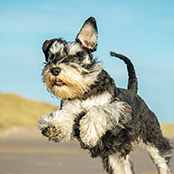 All terrier like breeds do love to run, dig and bark, you can train some of these traits out, but essentially if this is something you do not like it needs to be taken into consideration. The Cairn Terrier makes a great choice for a family pet. He’s sturdy and hardy and will tolerate little people. However, like with all breeds, it’s vital you teach your dog to behave around children (think doggy manners) and teach children how to correctly interact with dogs. Adult supervision is a must with all child/dog interactions. The Cairn Terrier is a wonderful companion animal and will thrive in the shadow of those who love him. He’s loyal, loveable and very playful. This breed loves being with their owners, so long endless days left outside on their own will spell disaster and will make your dog miserable. They love being in the warmth and comfort of your home and will also adapt to life inside an apartment as long as they are exercised correctly. Like with all breeds it’s important they have ample shade and shelter during the day. As they have a love for digging, it’s a good idea to check fences regularly for any escape routes. 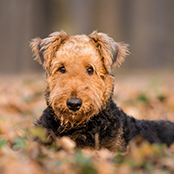 Some owners of terriers agree that it’s impossible to train the digging out and instead incorporate some digging zones and non-digging zones. Think raised flower/veg boxes or roped off areas so your pup can learn where they can and cannot dig.